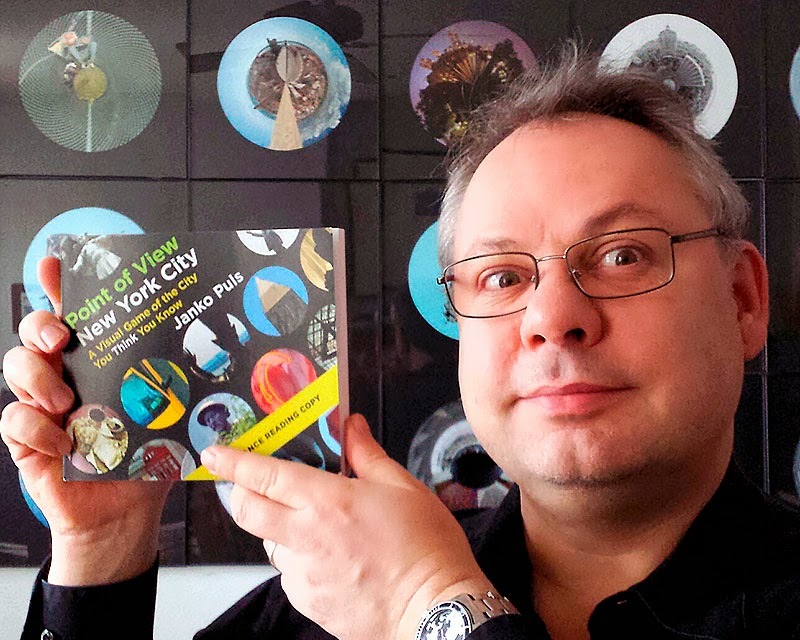 Point of View New York City: The Advance Reading Copy Is Out! The Advance Reading Copy Is Out! Look, what my publisher Paul Harrington from CN Times Books brought last night to our home! The Advance Reading Copy of my book! Hand delivery versus a good dinner goes a long way. An ARC is a preliminary version of the book to send out to reviewers. Most of the pages are in. In this case the acknowledgements are not included yet. Definitely still included are mistakes in the text part. The cover was changed a little bit after the ARC was printed. The size is right, though the book will come with a hard cover. But basically this is the real McCoy. All pictures are included, the introduction is there, the map, and the text part. A proud author holding the Advanced Reading Copy. By the way, the pictures in the background are hanging on our living room wall and are not part of the book but another body of my work: my small planets. You can see more of them here on Behance or Flickr, and the objects like wall clocks and alarm clocks I build with them here on Behance or Flickr.